Who doesn’t love chocolate bars? And if they’re packed with energy boosting goodness, nothing like it. Presenting an easy recipe for Walnut Mini Bars. 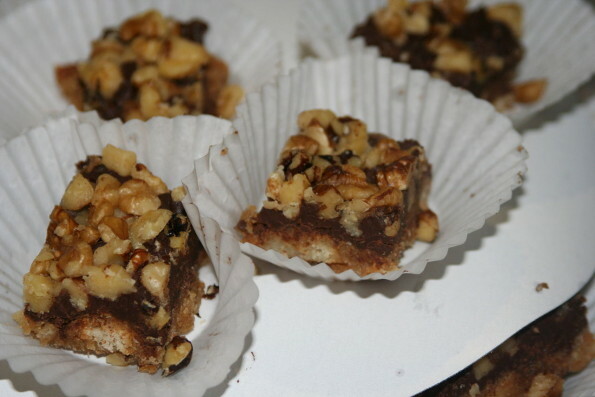 These Walnut bars are double layered. Made with flour, butter, walnuts and sugar in the lower layer and cocoa powder, sugar, butter and eggs in the upper layer, they are energy storehouses. Preheat the oven at 175 degree C and prepare baking tin by greasing it. To prepare the crust, cream butter and sugar until well blended. To this, add flour and walnuts and mix well. Spread and press down the mixture at bottom of prepared pan. Bake for 25 minutes in preheated oven. Now for the topping, combine butter, cocoa powder, sugar, eggs, vanilla, salt and water in a medium bowl. Beat nicely until smooth and shining. Spread a layer of this mixture on prepared crust in the pan and bake for another 20 minutes in the oven or until the chocolate is set. When ready, remove the pan from the oven and allow the bars to cool down. Then, sprinkle some confectioner’s sugar on top and cut into bars.